If the first few pages of a book has quotes by Rumi, I am usually sold. Though it doesn’t take too much on the author’s creativity to reproduce the lines of Rumi, the selection of the quotes from hundreds of very relevant quotes is no easy task. 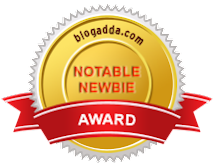 Abhimanyu Jha, the author of www.MarryAGhost.com won my attention right there. Whether he managed to hold it on or not is a different story in itself, but still 10 points to the selection of the Rumi quote and 5 more points to each of the other quotes in the preface. 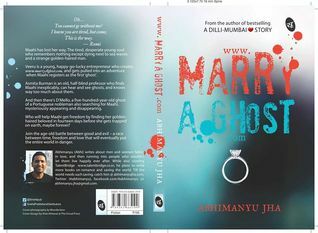 MarryAGhost – One would wonder what sort of a title that is. While the back cover the book has a synopsis of the book (with spoilers), it was both a cheesy title, and a title that piqued my interest, at the same time. Having never heard of this author before, I cautiously proceeded to read this book and man, I was drawn. Call it guilty indulgence or the craving for a break with a lighter book (having read A Fine Balance and This Divided Island prior to this – both heavy book), I must say I quite enjoyed reading most part of the book. The likeability of the book comes mainly with respect to the fact that the language is free-flowing and one need not invest too much time in trying to understand what is happening. There is also an advantage in that regard that there are just 4 main characters, with a couple more showing up at times. This minimal character count is perhaps easy on the light reader, and also you are drawn towards the main two characters greatly. The conversations between Maahi and Veeru are mostly not forced, as simple and realistic as what a couple would have (except that they are not a couple). I am almost tempted to use the spontaneous with respect to the premise, except for the fact that this spontaneity comes with a price. What could the book have done better or what could Mr. Jha do with the second part of the book? Oh yes! There is a ‘To be continued!’ on the last page, and it is indeed a pity that the book doesn’t have a mention of whether it is a multi-part series. Well, I am going to definitely want to read the next part, and I hope it is the only other part. Coming back to what the author could have done better, the first thing that any new author is guilty of is the repetitive nature of the conversations. It is indeed understandable that the two main characters have (sort of) fallen for each other and are insecure about the others’ feelings. But bringing this up every now and then can get a little annoying. Second, the book requires a total suspension of belief, which is to be understood seeing the title, but it would have helped if there was a logical flow to a few things like how the characters landed in Goa (there is a logic, but a flawed one! )Thirdly, the language is pretty light on the brain especially because is mostly conversational. But I fail to understand why the author uses the F-word with hyphens at a few places and uses it in entirety elsewhere. And why even use it in the first place? While the story in this first book ends at a pretty interesting point, what happens to Maahi, Veeru and the others involved at the end of the 14 days is something that I can’t, but will need to wait to check. This madly in love ghost could use some of your love with a suspension of belief.